When registering online for the first time, you must create a household user ID account. Once created, you will automatically receive non-resident rates. In order to receive resident rates, you are required to show Proof of Residency. Once your household has done this, you will be asked to verify residency annually. This procedure has been instituted to ensure district residents receive priority in enrolling for high demand activities. Documentation may be brought to the registration desk at either the Robert W. Rolek Community Center or the Sports Center during normal business hours. When registering by fax, it is mutually understood that the facsimile Release of All Claims, shall substitute for and have the same legal effect as the original form. The Park District is not responsible for incomplete transmissions. Please follow up with a telephone call to make sure your fax has been received. Learn more at our online registration page. Where do I find Camp Packets? Go to www.rlapd.org/camp-programs. Within each tab, camps have been sorted by interest. Look inside the chart for all pertinent information including camp packets, age, and location. All programs require a minimum number of participants 5 business days before the class begins. A maximum number is also listed to ensure quality instruction. Classes may be combined and times modified to facilitate better programs. Your receipt is your confirmation. We do not send additional confirmations. Please mark your calendar. If we are unable to process your registration, we will contact you. If you fax in your registration, we will mail your receipt to you. If you register on-line, please print your receipt for your confirmation. We do not mail on-line registration confirmations. We are not responsible for faxed registrations. If you fax a registration, it is understood that machine error is not the Round Lake Area Park District's responsibility. Please follow up with a telephone call within the hour of faxing your registration form. In order to receive resident rates, you are required to show Proof of Residency. Once your household has done this, you do not need to repeat the process. This procedure has been instituted to ensure district residents receive priority in enrolling for high demand activities. Do not send cash. We accept checks, money orders or credit cards (on registration form). Master Card, Visa, Discover and American Express are the only types of credit cards we accept. A $15 service fee will be assessed on all checks returned due to insufficient funds. If the Park District cancels a program, registrants will receive a full refund. Cancellations made by registrants more than 5 days BEFORE the start date of a program will receive a full refund minus 20% up to a maximum of $10. Less than 5 days, refunds can be prorated. Once a program begins, a Program Supervisor's approval is needed. Refunds will be returned via check by mail. It takes approximately four (4) weeks to process a refund. Refunds due to illness must be accompanied with a doctor's note. A Refund Request Form needs to be completed by a parent/guardian 18 years & older to be considered for a refund. It's sometimes difficult to figure out if you're considered a park district resident or non-resident. Generally speaking, if your house address has four digits and you live within the incorporated village boundaries of Round Lake, Round Lake Beach, Round Lake Park and Round Lake Heights, you are a resident of the Round Lake Area Park District. 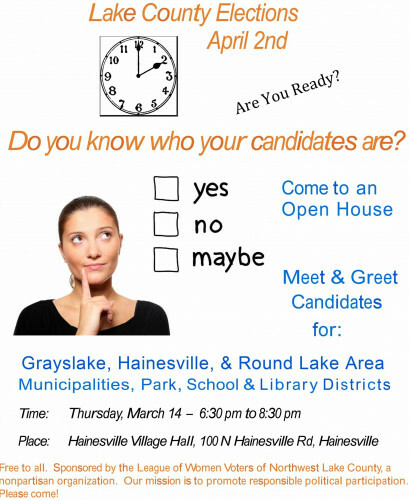 If you live in Hainesville west of Hainesville Road, you are also a Round Lake Area Park District resident. There are also portions of unincorporated areas of Round Lake that are within the park district and boundaries. An example of this is the Prairie Point subdivision in Round Lake. This entire subdivision, although almost totally surrounded by the park district residents, is not in the park district. Conversely, some persons who live on Nippersink Road in unincorporated Round Lake are park district residents. If you are unsure if you are a district resident check your voter's registration card which identifies all the taxing districts you live in, or check the Lake County's web site, co.lake.il.us/mapsonline. This site will allow you to see, by your home address, what taxing districts you live in. Or, if all else fails, call us! A family is defined as parents and their unmarried children, through 21 years of age, residing with them. Children, 22 years and older, as well as other relatives and / or individuals in the same household are NOT in the definition of family. The District is committed to meeting your unique, individual leisure needs. Every attempt at reasonable accommodations will be made so that individuals may participate in desired programs.